Beautiful red bouquet in dark contrasts. Gorgeous combination of deep red and light pink roses. shaped rosette with a deep red color and develops velvety purple tones as the bloom ages. Dark romantic red and peonies. Love it! a more structured look with one type of flower. come to mind. A striking pure red rose with velvet petals and a strong, delicous scent. 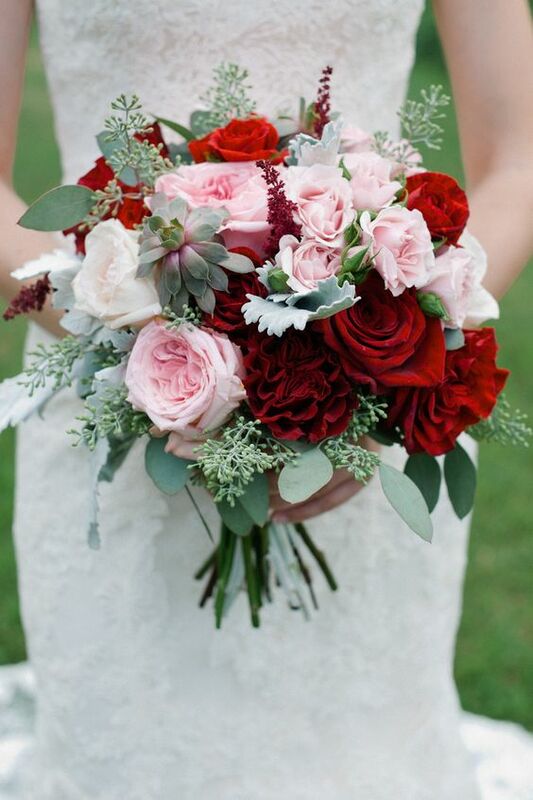 Loosely tied red bouquet with Juliet roses. Those red velvety petals remind me of our Lady Killer rose! Wonderful bouquet with David Austin Tess Roses. Red, white and berries. Great combination! Fairly simple, but festive nonetheless. David Austin Wedding Rose Tess’s spectacular blooms are made up of many, sumptuous, deep royal red petals. ruffled petals, forming magnificent, saucer-shaped rosettes, which give the impression of great depth. Long stemmed red roses with a simple tie. Gorgeous! Daring combination of red roses and red tulips. Want to see more garden roses perfect for Valentine’s Day? Just take a look at our assortment page! Make sure you order your roses in advance so we can ensure you their availability. Just give us a call or send your order to sales@parfumflowercompany.com. We’re happy to help 🙂 If you want a beautiful bouquet with garden roses for Valentine’s Day, have a look at our store locator and find a florist in your area. Let the romance begin!